Andrea Kats (@PastaVersaucy on Twitter) is your typical young adult, except she's the one who came up with the popular "it me" meme. When I first wrote about the origins of the "it me" meme, I wasn't able to conclusively determine who started it and thus inadvertently neglected to mention Kats' contribution. But fear not! To remedy my unfortunate oversight, I interviewed the memestress herself. 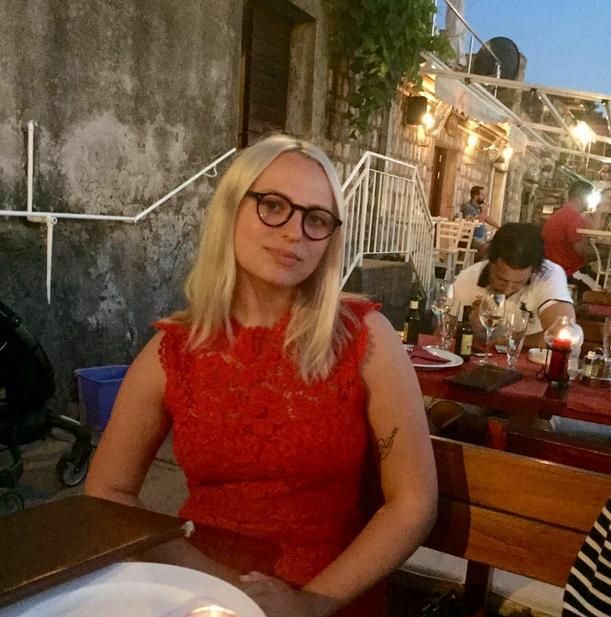 Read on to hear her thoughts on everything from how James Franco texting that underage girl in 2014 spawned the meme to becoming "The Goatfucker Pasta Queen." What was your original idea for "it me"? Honestly, the idea was so much simpler than imagined. It's kind of funny, seeing as how you went to lengths to figure out where it came from. 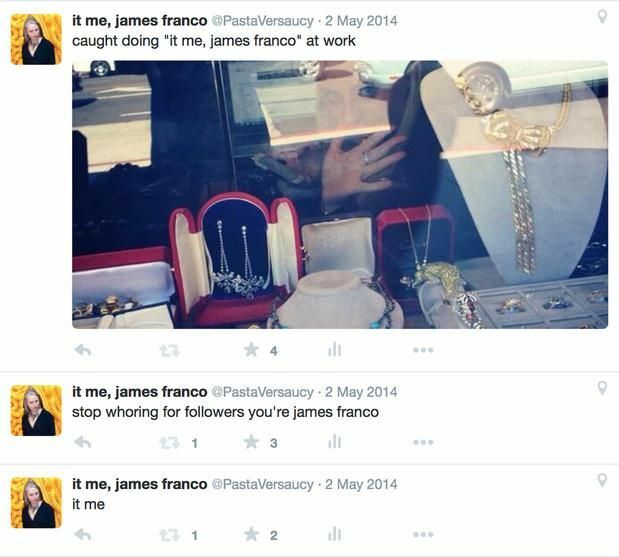 I just came up with "it me" the day after the "James Franco texting an underage girl" scandal broke. 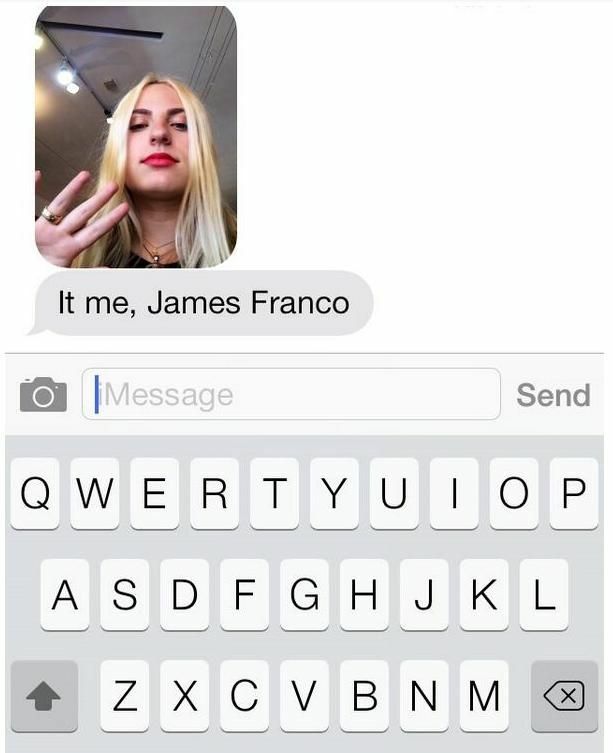 The joke originally came from me wanting to parody the generally hard-to-read conversation between the two in which the 17-year-old girl asked if she was truly speaking to James Franco, and his response was a cringeworthy selfie followed by "it's me." When I mocked up the text conversation and got to the "it's me" part, I decided to simplify it to "it me." Considering the intended awkwardness of the selfie, it felt like an incomplete gesture, which needed an equally incomplete caption to it. "It me" read as if a child wrote it -- it just felt right. But it feels strange to take credit for what would seem to be just an intentional grammatical error. I think you're taking credit for the fact that you're funny, if anything. I feel like a small town girl who got discovered in her coffee shop for breathing. It's weird how the Internet persona is just a single facet of my life, but brings me joy in the best ways. But in the beginning I hated seeing people use it. Prior to making that meme (which I'd say started out as me meme-ing James Franco) I only appreciated "weird Twitter" jokes, but wasn't great at making them. In a sense "it me, James Franco" was my baby -- it set me on the course of being "The Goatfucker Pasta Queen" (I've picked up some strange hobbies on the deep web). I started using the phrase "it me" as my identifier, and when other people were using it, essentially it felt like my nom de plume was being taken from me. This was also nearly two years ago, when I felt like obscure internet fame was truly an important feat and I invested way too much time into making jokes. Now obviously I have a different outlook on that. I think it's ridiculous that two simple words I strung together have traveled to all corners of the internet as a "meme." How did you feel the first time you heard someone say "it me" online? I felt a weird jealousy that was [as if] my favorite doll was being changed out of her clothes and made-up as something different. Why do you think "it me" caught on? Honestly I think people started using it because it sounded funny. That's really where the whole idea came from -- just a grammatical error that sounded funnier than its "correct" counterpart. The way that memes are usually made...is by figuratively "murdering" the crap out of the joke via excessive posting. [Or at least] until people are forced to like it, usually out of hate for it, or lack of understanding, in some sense. 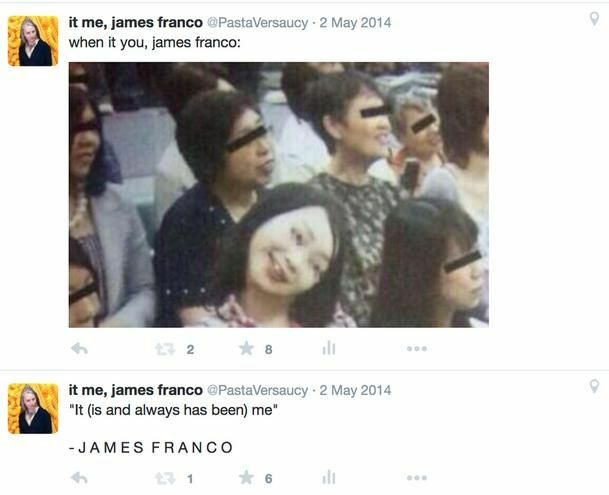 I did that with "it me, James Franco" and started using "it me" as my signature...and once all of my friends unfollowed me for clogging their feeds, all that was left were some weird Twitter people who got in on the memes and the selfie-posting world that appropriated it as their own cute caption. Would you say more women use it than men? Yeah, I'd say women use it more. Something about "it me" has this childlike tone to it and a lot of the Internet nowadays is essentially teen girls idolizing "baby-like" behavior. How do you feel about not getting proper credit? I think part of what makes me hate "it me" is the ego [deflation of], "I won't ever really get credit for it." Which is so pointless considering the Internet is full of plagiarism. I'm surprised you're not mad at my article. I think it's amazing that you were trying to find out the origins of "it me." I've watched my baby become a star and I'm just the man behind the camera in that sense. I think a big part of "it me" is just [that it's used on Twitter by] a bunch of middle-class teenaged girls who love strawberry milk and American Apparel tennis skirts...also the guys who are like the "I'm going to be Ã¼ber-cute and put my finger in my mouth for this selfie." I guess "cyber-selfie Twitter" is the best way to define that.